Week 12 project just finished. It's been a very busy week. I was on spring break from my college art class but there was plenty of homework to do. You know, if I'm going to be a better quilter than I think I need to learn how to draw. I'm working very hard at it, so I hope it's true. 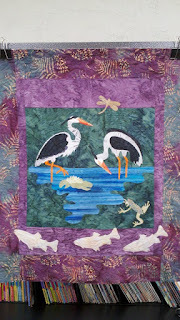 This week's project is a pattern by Mckeena Ryan titled Heron Pond. It's one that I picked up several years ago but never found time to make it. I've also upload my art drawing for the week. We are drawing white objects and we are starting with charcoal. I have decided that after my art class is over in May, I will only be doing original designs. It has been very hard and humbling to do other people's patterns. So without further ado.....My projects. Sorry I cannot crop my pictures at the moment, my computer crashed and I'm having to download all my programs again. Until next week, keep on quilting..
Well the week came and almost went but I finally pulled it out. On Saturday afternoon I had still not started a project. I felt like my creativity had been sucked out of my body. My brain said come on and throw something together so I picked a simple appliqué and started. The fabric was the wrong shade so I sprayed on some walnut ink and dried it with a heat gun. Okay, that was better. Then the appliqué looked too plain so I thought I have a little fiber I can add. Then it needed beads, so my simple appliqué wasn't simple anymore. It's amazing what a little perseverance can do. 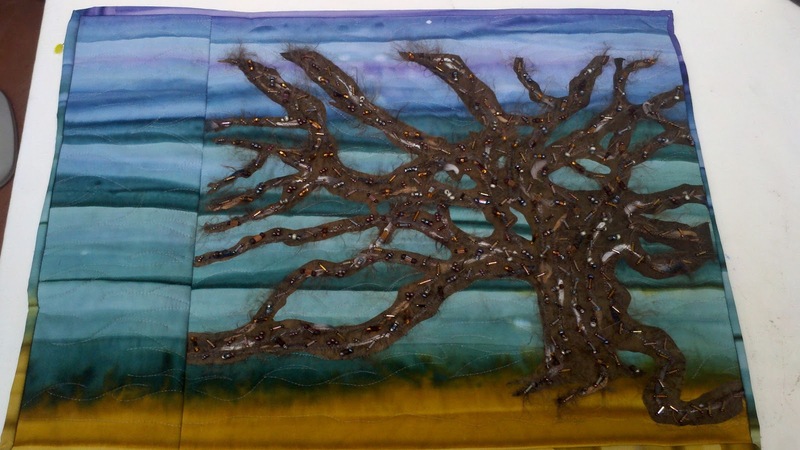 So here is my week 11 project entitled "The Tree of Dreams." Just remember, when you think you don't have it in you, you do. Remember the phase "keep on trucking?" Well, I did and so can you. 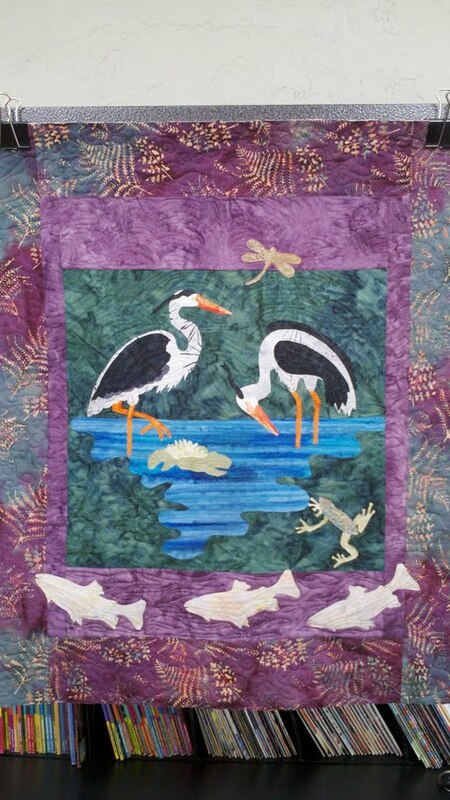 Keep on quilting. Week 10 Challenge. Yep, I'm posting early this week and I don't even know how that happened. Last weekend, we went on the Miracle Mile Art Walk in Los Angeles and then to Santa Monica to catch the sights. A great time was had by all but you can check out the details of the Art Walk on Casey's blog at http://www.caseysharpe.com. This week has been very busy. I had to finish my art midterm drawing of a building in Balboa Park. I went on Wednesday afternoon and again on Friday and it is now finished. Not perfect but a decent attempt. 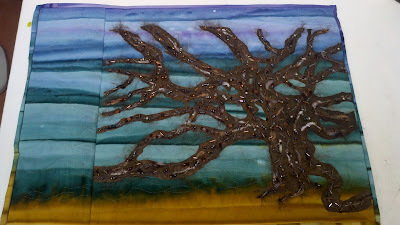 I am learning lots in my college art class and my motto is going to be "If I can draw it, I can quilt it. " 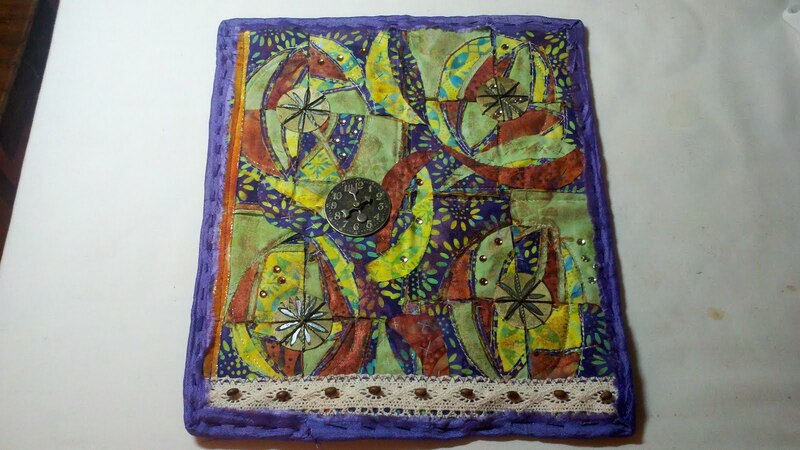 This week's mini quilt is a Mixed Media piece that I got the idea from the dvd "Mixed Media Art Quilts" by Beryl Taylor. I'm not that much into mixed media, but I think I started and finished a good attempt. 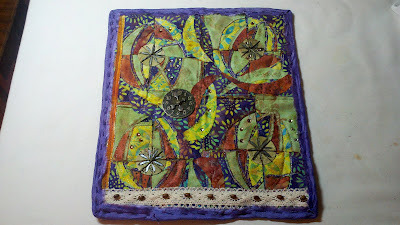 I used reverse applique, making mixed media out of watercolor paper, walnut dyes,shiva paints, stamps and ink, fibers, glue and jellies, metal pieces and silk ribbon. I'm sure I left something out but it was hard to stop once I got into it. It turned out ok and it was lots of fun. I learned lots and really worked outside of my box. Makes me wonder what I'm going to do for next week's project. We shall see.. Just remember to challenge yourself and keep on quilting. Week 9 has come and gone but I did finish my project, I learned lots and it turned out pretty well. The quilting is done in a varigated black and white, an adaptation of a quilting design that I learned in Houston- I'm sorry, the quilter's name escapes me at the present but I will track that down by my next post. 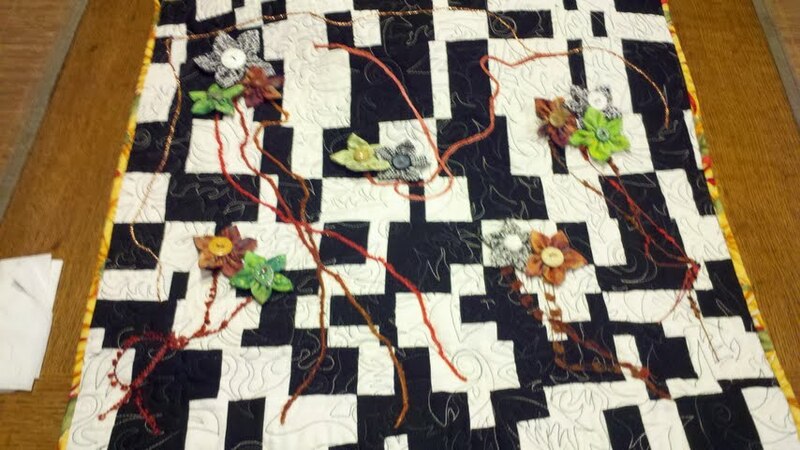 This quilt includes a black and white background, fabric flowers that I made and embellishments. I'm not that big a fan of buttons on quilts but these semi suited it. I spent the weekend in Los Angeles/ Santa Monica and now have even more ideas for quilts. Hope everyone's week was as awesome as mine and I hope you finish those projects that are lingering about.